Last week Jeff and I found ourselves working our way up a trail we were all too familiar with. Once again we were heading into the Snyder Lake basin to attempt another new route on the North Face of Mt. Edward. The weather wasn’t holding true to the forecast and heavy cloud cover with slight snow obscured most of the face. However, it was stable and climbing conditions were acceptable. We approached the face watching the occasional slide rush down the mountain. Just spindrift slid, the major snowpack was stable. At the base of the route, we could occasionally see through breaks in the clouds. 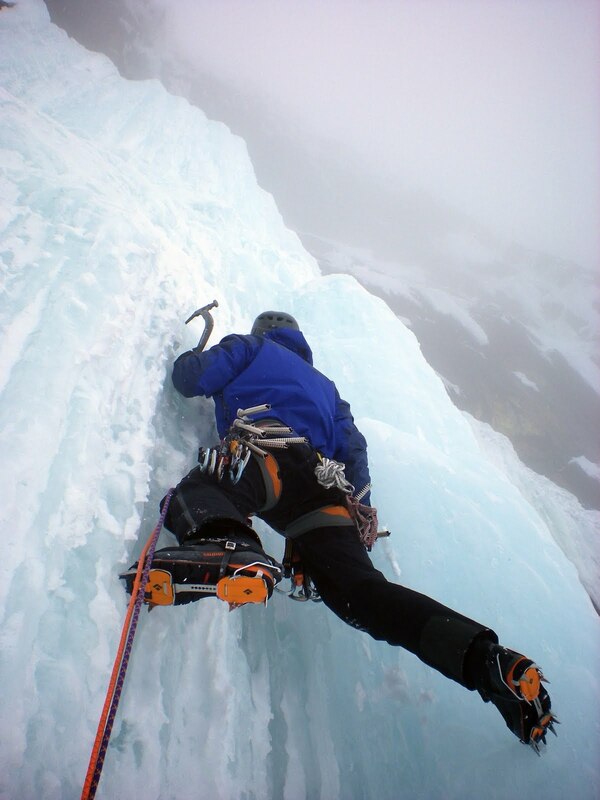 The ice looked good and we started climbing immediately. As expected, the ice was steeper than appeared. After a slight burn in the arms I was at a suitable belay stance. Jeff came up and quickly started the next lead. The climbing was going great. Good ice and favorable temps made progress quick. Jeff was nearing the top when skies opened up for a moment. Finally some sun. Then I noticed spindrift off to the side of us. Suddenly, the entire blue sky above me became white. It came down in slow motion and I was mesmerized by the swirling snow caused by upward wind gusts. Was this spindrift or a real avalanche? Will it shoot over us? What ever it was, it looked big and looked like it would hit us. “Avalanche, hang on!” I ducked under the pack, clinched my break hand, and waited for impact. Light snow pounded us. Eventually it ended and with no tension on the rope, I figured Jeff was ok. I looked up and saw him start to climb again….game on. He reached a nice belay and brought me up. Now we were under the business, rock leading to hanging daggers. Temps were warm though and the ice barely attached. I climbed up about 30 feet to take a closer look, but conditions looked too dangerous to continue. It was time to bail. We made hast to minimize our exposure to the enormous daggers. At the base we dug out our packs and quickly headed down slope to our skies. The slide had taken out one of Jeff’s skies, but luckily we found it quickly. On the ski out we heard some other major slides and agreed we made the right decision to leave. The route will have to wait till another time.